We're by no means the only important Peanuts Internet site (although we'd like to think we're in the Top 10!). Below you'll find links to all of our favorite Peanuts Web destinations. Click here to learn up-to-the-minute information about the Charles M. Schulz Museum and Research Center, on the corner of West Steele Lane and Hardies Lane, in Santa Rosa, California. You can check out the museum "mission statement," take a look at photos of the groundbreaking ceremony, and (many months later) the grand opening ceremony. This site will just keep on growing and growing, so bookmark it and visit often! 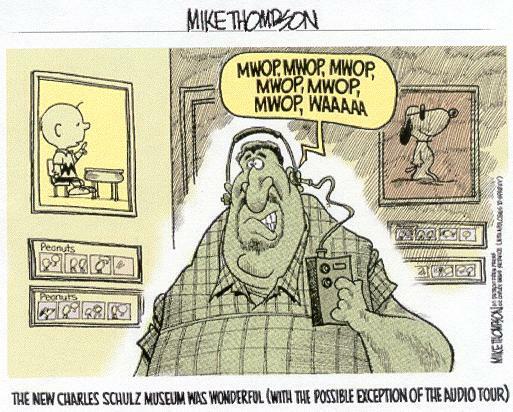 The result of more than two years of planning, the museum was conceived to celebrate and explore the life and art of Charles M. Schulz, the 20th century's most influential cartoon artist. The 27,384-square-foot museum includes permanent and temporary galleries, a 100-seat auditorium, classroom space and outdoor gardens. The project architect is C. Davis Robinson Architects, of San Francisco. Ace photographer and PCC member Scott McGuire was on hand during the many opening-weekend activities at the Charles M. Schulz Museum. He has posted dozens and dozens of pictures he took during those five days, and you can see them right here. Althoughugh Peanuts comic strip creator Charles Schulz insisted that he was not a philosopher, his cartoon creations certainly proclaimed plenty of their own philosophies. From Charlie Brown's "I only dread one day at a time," to Lucy's renowned "Happiness is a warm puppy," the Peanuts Gang's philosophies are explored in the Charles M. Schulz Museum's newest exhibition, Peanuts Philosophies. Sixty-five original Peanuts comic strips will be on display in the Museum's strip rotation gallery, running through July 11, 2011. Peanuts Philosophies focuses on the insights of Charlie Brown, Sally, Snoopy, Lucy, Linus, Rerun and Peppermint Patty. "Most longtime Peanuts readers know that many of the characters are deeply philosophical. Much of what has fascinated and entertained us for decades has been the spectacle of little children afflicted with adult concerns," said Schulz Museum Curator Jane O'Cain. Although his characters tend to ask life's age-old questions, Schulz consistently stated that he was not philosophizing but simply drawing a comic strip; "For me broadly to tell you that everything I draw has a meaning just isn't true. Most of the time, I'm merely trying to be funny." Among the Peanuts philosophies chronicled are; Sally's nineteen irreverent philosophies, for example, "Who cares?" and "Where will it all end? ", and Charlie Brown's night-time musings where he searches for meaning in the middle of the night, with Snoopy draped over him asleep, seemingly without a care. In addition, Linus' philosophy of "Five hundred years from now, who'll know the difference" and his cynical retort "I love mankind ... it's people I can't stand" are revealed. 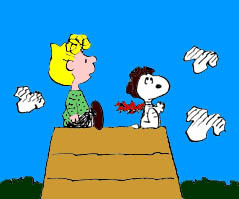 Unlike much of the gang's ponderings, Snoopy's search for meaning often ends at his dog dish, with philosophical tokens like "You'll never convince me that there's more to life than chocolate chip cookies." The second half of March at the Charles M. Schulz Museum is studded with three women superstars in the cartoon world. Hilary Price, creator of Rhymes with Orange, will visit the Museum on Sunday, March 20th; one week later, on Sunday, March 27, the creator of the iconic cartoon strip, For Better or For Worse, Lynn Johnston, will be joined by Jan Eliot, of Stone Soup. Hilary Price will be at the Museum on Sunday, March 20, from 10 to 11:30 a.m., teaching a Master Class for Adults who are interested in cartooning. Price's class will explore tips and tricks for creating a new cartoon every day. Advanced registration is required: Call (707) 284-1263. At 1 p.m., Price will give a presentation about her work to the general public, after which she will be available to answer questions and sign books. Price's gag-a-day, single panel comic strip, Rhymes with Orange, recently won the Reuben Award for best newspaper panel cartoon of 2010. At 1 p.m. Sunday, March 27, Lynn Johnston and Jan Eliot will discuss their work, answer questions and sign books. Both Johnston and Eliot are creators of comic strips that demonstrate the loving and at times challenging familial relationships. Johnston and Eliot's work give different perspectives on sibling relationship and add to the dialogue of siblings in the comics with our current in-house exhibition, The Browns & The Van Pelts: Siblings in Peanuts, running through June 19, 2011. 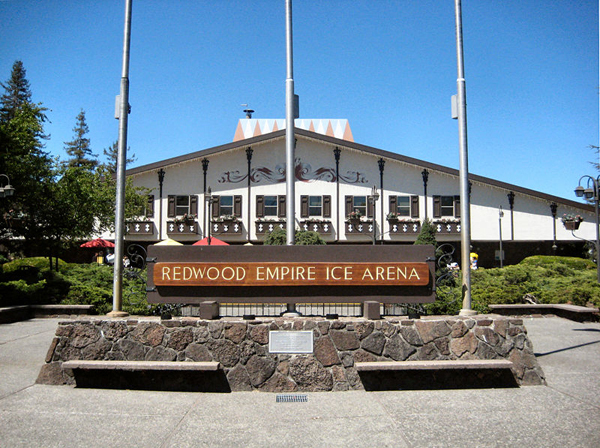 No visit to Santa Rosa, California, is complete without a stop at the Redwood Empire Ice Arena, better known as "Snoopy's Home Ice." Aside from being a gorgeous, Swiss chalet-style ice skating rink, the complex boasts the Warm Puppy Cafe, where Peanuts fans can curl their lips around a Peppermint Patty (a delicious, mint-flavored hot chocolate) and other menu items with equally droll names. The arena is nestled between the Charles M. Schulz Museum (just across the street) and Snoopy's Gift Shop and Gallery, where you'll be tempted to purchase all sorts of Peanuts-themed goodies. And you won't want to miss taking regular looks at the Redwood Empire's "bench cam," which is aimed 24/7 at a cute bench just outside the entrance. Next time your Peanuts pals visit the arena, have them sit on the bench at a pre-arranged time, and you'll be able to see them! Finally, you can visit Snoopy's Home Ice on Facebook, as well. Although not really a fan site, this new Peanuts Web destination -- set up following the transition from United Media to Iconix -- illustrates how Snoopy and the gang are "branded" in the United States and around the world. You'll get a strong sense of media coverage, licensing, the spread of amusement parks that star the gang, and so forth. Potential licensees also will find this site helpful, as it explains how to get in touch with the new company -- Peanuts Worldwide LLC -- in order to learn more information. 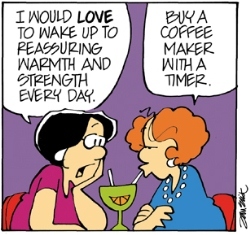 Plus, you can read the day's strip in the upper right-hand corner. Andrea Podley started this gathering of Peanuts fans quite modestly, back in 1983, and the Club soon grew to international proportions and a membership base of several thousand folks who couldn't get enough of Charlie Brown, Snoopy and the rest of the gang. The Club's Beaglefest conventions achieved the status of legend and, with the help of the Internet, fans have networked as never before. Drop by and check out the Club's most recent activities, and tell 'em we said hello! Their motto is Exceptional dogs for exceptional people, and truer words never were spoken. The Peanuts Collector Club donates a portion of every annual membership to CCI, and also has raised lots of money for them during Beaglefest and other Club activities. If you'd like to learn more about the organization that is near and dear to Charles and Jeannie Schulz, then please visit this site ... I promise, you will come away transformed! Want to get involved with something that'll make you all warm and fuzzy? Project Linus delivers security blankets to children all over the world. This wonderful organization has over 270 chapters in the United States, Canada, and Australia. Originally targeting pediatric cancer patients, Project Linus has broadened its focus and now aims toward seriously ill or traumatized children ... children in need of a big hug. So what're you waiting for? Drop by and see how you can help! Disey has been something of a faithful "town crier" for the Peanuts community since 1997. She maintains a chatty Web site and also sends out a regular e-mail newsletter that's filled with information about upcoming swaps, gatherings and other events, along with "for sale" ads posted by fans. You can sign up for the newsletter at this site, so what are you waiting for? You want to be connected to the Peanuts world, right? Everybody mourned when we lost veteran animator Bill Melendez in the summer of 2008. He's the genius who brought Charlie Brown and the gang to TV and the movies, and you'll have a blast navigating his Web site. Aside from cute Melendez animation, you'll hear Vince Guaraldi's Peanuts music, while finding out how Melendez began his career, what he did for so many years, and oodles more. What're you waiting for? This site has a section devoted to Camp Snoopy, its "Amusement Park Within an Amusement Park." Check out the pictures, and you'll be making reservations tomorrow! You also can visit them on Facebook here. Nat Gertler has compiled a well-explained book list, cleverly set up in outline form to easily distinguish different types of collections. He also sells a large array of Peanuts books, CDs and videos online. Sculptor Stan Pawlowski has been a fan of Charles Schulz and his Peanuts characters for years. Learn all about his work here. Got a question? Send us an e-mail!